I released a short post outlining this project in November of last year. 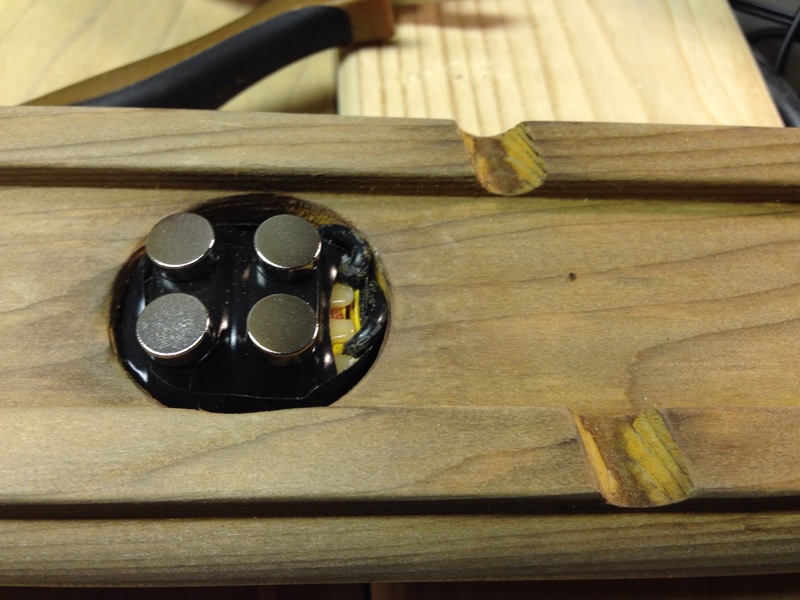 At that time, I thought it was complete; however, I had been unhappy with certain aspects of the build. The cat bowl did not sit flat on the drip pan and the steel gauge was too thin, which caused an intermittent rattle. The threads on the brass rod did not hold the first and sixth string in place, so they would frequently shift to a neighboring thread without warning. I believe that I have remedied the situation by switching out the bridge materials. 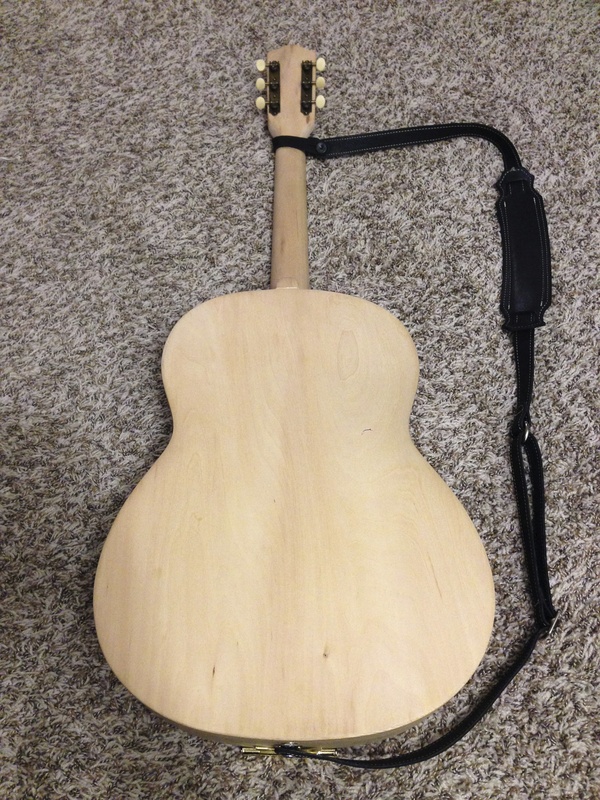 I had been considering this idea for over a year and knew this acoustic would be an excellent candidate when I picked it up at a local antique mall for under fifteen dollars. I found the stove drip pan and two small drains early on and recently replaced the original cat bowl and brass thread rod with a stainless steel strainer and small diameter brass rod. 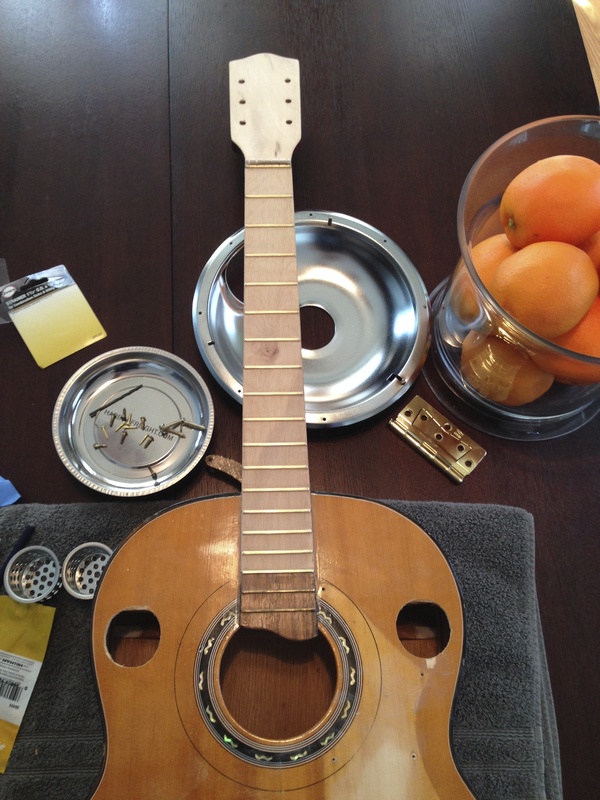 I measured the drip pan and then found the center of the guitar. Using painter’s tape. 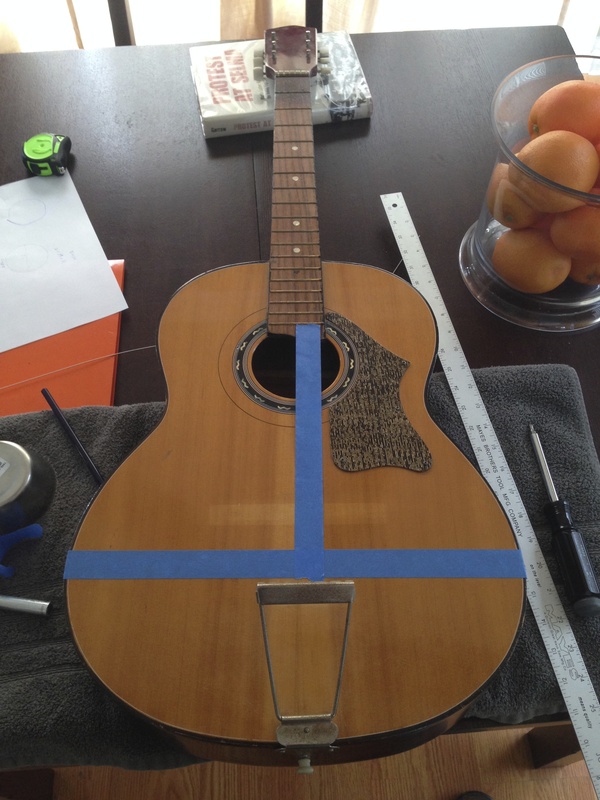 I marked the vertical center and then placed the drip pan on the guitar to find the correct position. I marked the horizontal cross point with painters tape. I placed a large adjustable compass on the center mark created by the tape and traced a circle. Then, I peeled the tape off and completed the circle. To cut the large hole, I drilled a couple of starter holes and then carefully cut along the reference line with a mini hacksaw. 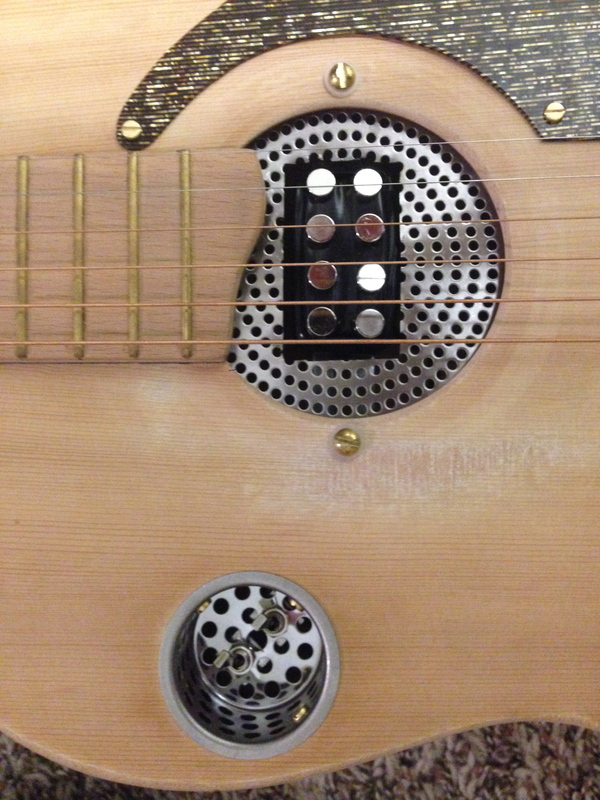 I had two small 1-1/4” drains that if felt would look cool as sound hole inserts and their 1-1/4” depth would keep the switches beneath the guitar’s surface. 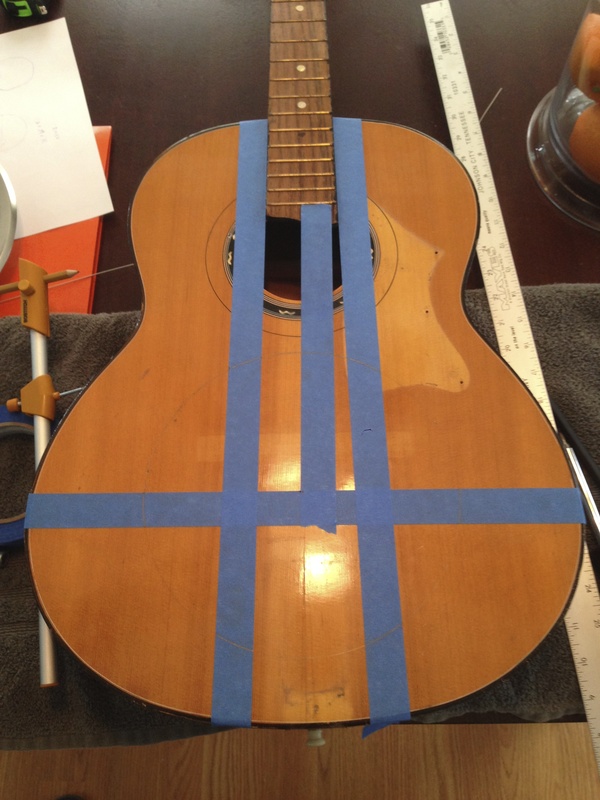 I located the bracing beneath and found a happy medium between the pick guard, bracing, and outer edge of the guitar. A 1-1/4” spade bit made a quick hole on each side. I took all of the finish off—head, body, neck, fretboard; everything—with 120 grit sandpaper and followed up with 600 grit sandpaper to smooth the wood. I also polished the brass frets, which turned out to be a nice feature. I had planned to apply a vinegar and steel wool mixture that creates a rustic finish, but decided instead to leave it natural. 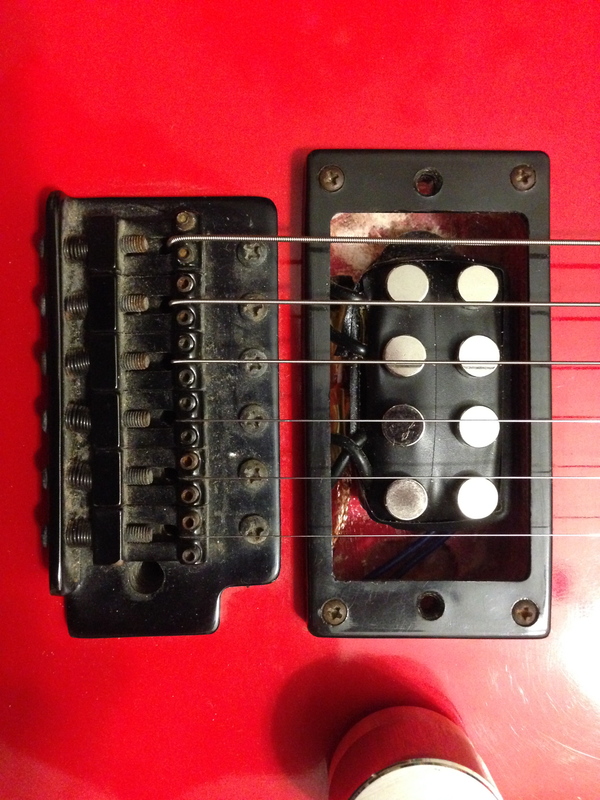 I filed small notches for six strings in a 3-1/2” hinge, lined it up with the fret board, and then installed it. I had found a brass friction lid support that would make an awesome tremolo arm—I cut the extra material away and fabbed the nut plate. 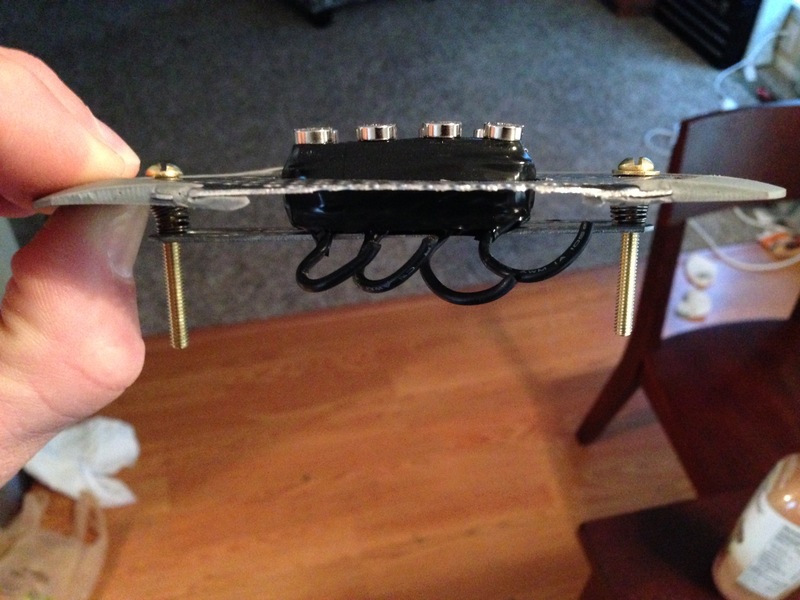 Additionally, I added a 1/4 mono endpin for the strap and a 1/4” stereo jack. By that time, my new tuners had arrived, so I installed them. I screwed the drip pan down and then went to work on the new bridge. A light bracket worked perfectly for anchoring the strainer to the drip pan. I super glued a washer and nut to the bottom of the bracket and added electrical tape to the ends for grip. Similarly, I added electrical tape to the rim of the strainer. 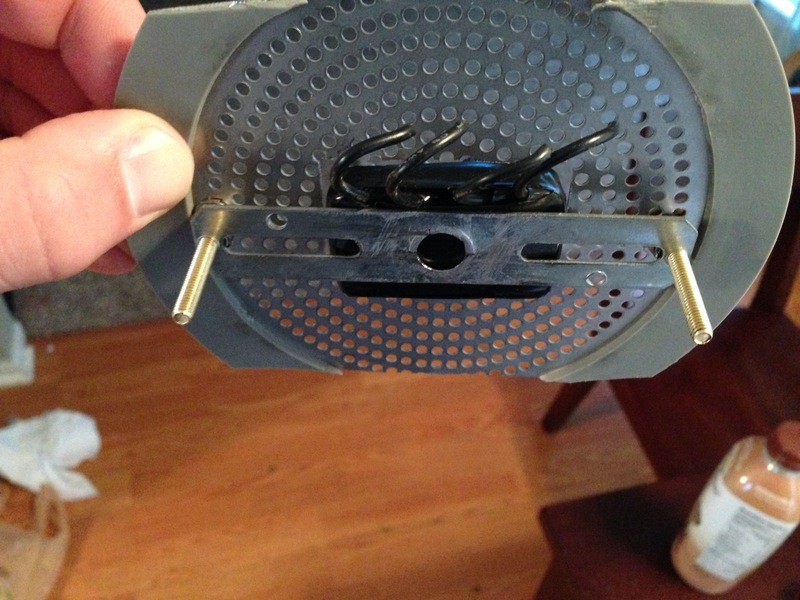 The top of the strainer was notched and a hole was drilled for the brass bolt. The bracket was placed on the underside of the drip pan and the strainer on top, with the bolt holding them together. 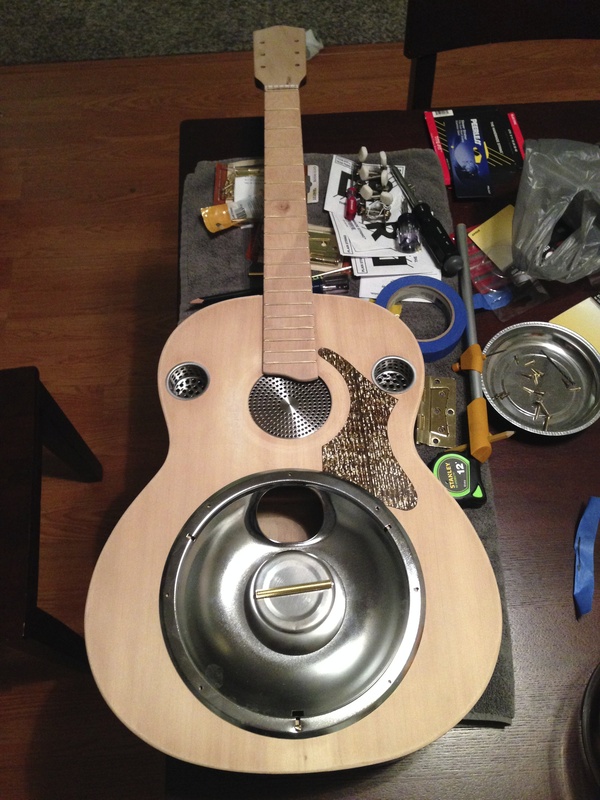 The rattle is gone and the guitar is louder with the holes in the strainer. Plus, the brass rod is smooth, so there is more freedom for the string to move when it is plucked or bent. It tunes well and strobing is as easy as moving the strainer before it is tightened down. 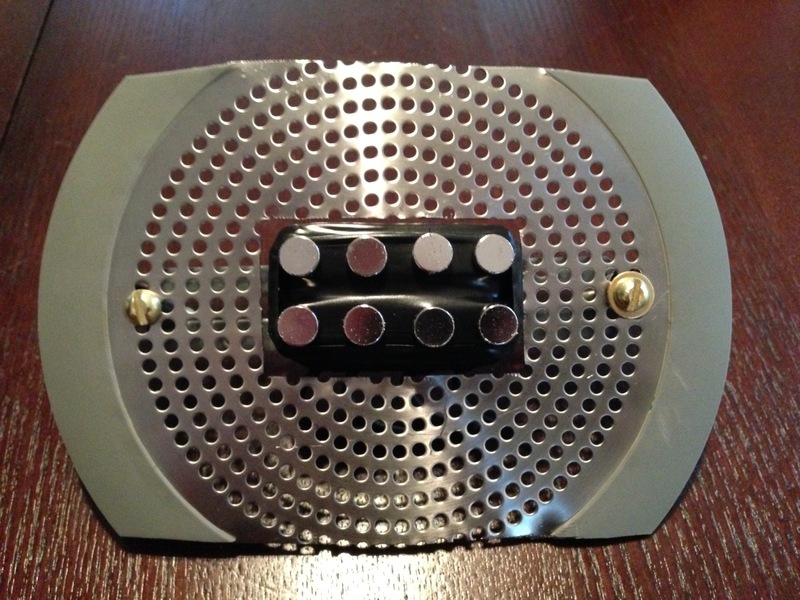 I began working on the pickup and had found a nickel plated drain cover that seemed like it would serve both as a cool looking cover for the sound hole and a stable acoustic pickup adapter. 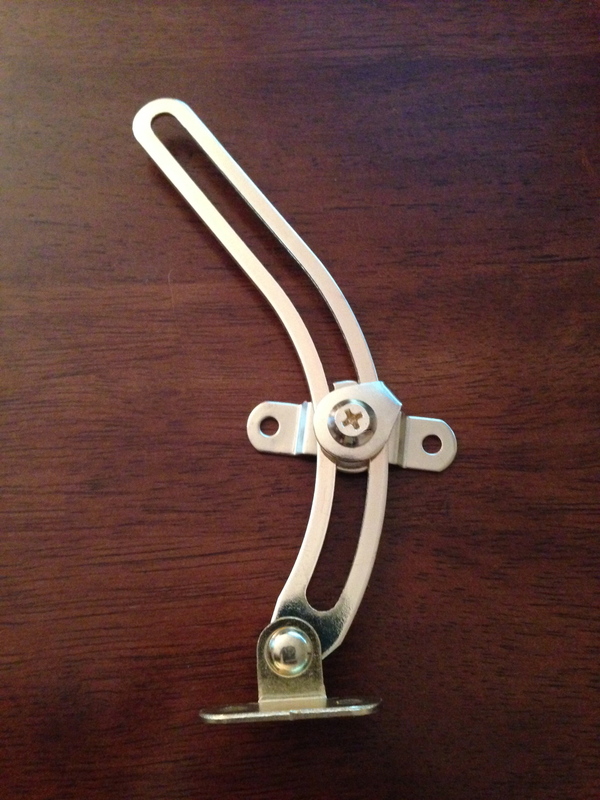 I bought a mounting bracket that usually holds lights to the ceiling in a junction box and cut off the cross piece. 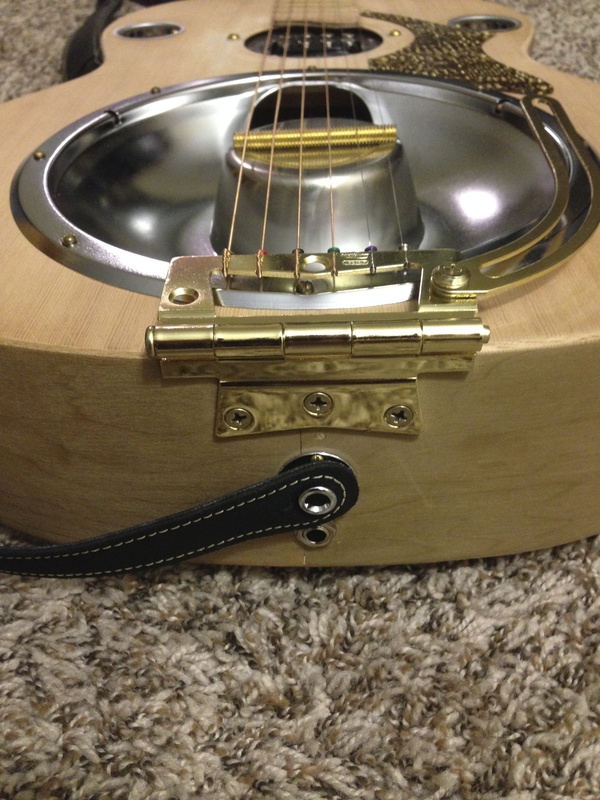 I found brass screws that would thread into the mounting bracket, added some springs to each side, cut a rectangular hole for the pickup and installed it on the guitar. 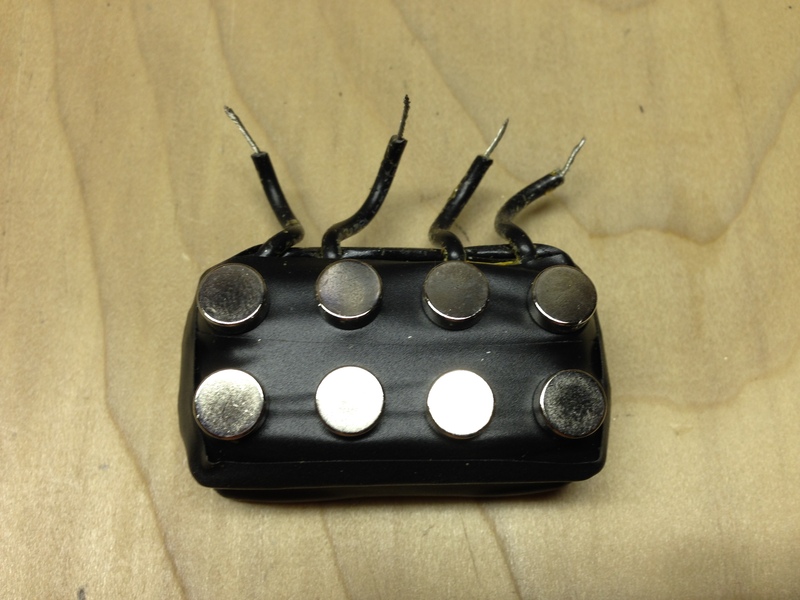 These make excellent replacement pickups for electric guitars, are a practical way to amplify an acoustic guitar, and half of a pickup is perfect for a three string cigar box guitar. If each side is wired independently, as was the case with the electric and acoustic guitars pictured, a stereo effect can be achieved, which sounds pretty cool. I’ve been happy with its sound and playability thus far and the semi-high action makes it excellent for playing slide.